TORONTO (CelebrityAccess) — Former CBC radio host Jian Ghomeshi is free on a $100,000 bail after being arrested on charges of sexual impropriety. According to the Calgary Herald, Ghomeshi faces four counts of sexual assault, as well as one count of “overcome resistance – choking” which, under Canadian law indicates that Ghomeshi was alleged to have attempted to choke someone into unconsciousness. 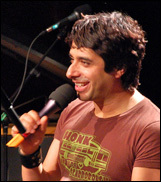 In late October, Ghomeshi's employer, the Canadian Broadcasting Corporation, announced that they were ending their relationship with Ghomeshi over allegations from multiple women that Ghomeshi had sexually assaulted or harassed them, and after viewing what was described as graphic evidence. At least three of those women went to police with their charges, leading to Ghomeshi's arrest on Nov. 26th. Ghomeshi's next court appearance will be on Jan. 8. Ghomeshi maintains his innocence, stating in a Facebook post that the is the victim of a smear campaign by an ex girlfriend. He also filed a $55 million lawsuit against the CBC over his dismissal, but eventually dropped the charges and is now on the hook for CBC's $18,000 legal defense, the Toronto Star said.